What You Get Right Out of the Box? Simple is a good word to use when describing this night vision product from Night Owl when you first pick it up and look at it. It features just two buttons that are used to operate it and a few places to adjust the lenses too. That usually translates to a device that is simple to use when out in the field too. There is nothing to assemble with this unit before using it but you will need to purchase and install a 123 lithium battery for it because it is not included in the package. However, it does come with a very convenient belt pack that will protect the unit nicely when you are not using it and make it very easy to take out and put back as you are using it. Why did This Model Night Vision Product Make My List? This is one of my favorite night vision devices that I tested. It features a little bit of everything. I just talked about how it is built sturdy and looks good. It also is very simple to operate yet you can still accomplish a lot with it. It has great optics which will easily help you spot and identify the potential game that is moving around in the vicinity of where you are hunting. It is also an incredible compact unit that does not get cumbersome at all even after prolonged use. When you combine how well it works with its affordable price point there simply is a lot to like about this impressive Night Owl brand monocular. What types of Optics does it feature? As with most of monocular devices I took a look at this one use first generation infrared technology. Make no mistake about it, this technology works well and does so at a price that is easy on the budget. The resolution on this product is exceptional and you will have no problem whatsoever spotting and identifying potential nighttime game to shoot. It also has a secondary illumination control which will greatly enhance your ability to see low light signature objects. This intensifier worked better than on many of the other model night vision products I tested. If you purchase this monocular product you will be more than happy with the way the infrared optics work. What other Vision Enhancements does it have? This has a nice 3X magnification system built into it too. That is really great to have if you want to zoom in and be sure what a distant target is that you are shooting at. You can never be too cautious when you are out hunting at nighttime. Nighttime predators are also very cunning and sometimes they are easier to bag at a greater distance too. It makes good use of the 42 mm lens that comes with it too. It helps make the resolution on the optics of this device all that much better. You will sacrifice some field of view with this lens though as it has only a 19 degree scanning range. If that is not enough for you then go with a wider angled lens night vision product such as one that uses a 20mm lens; just be aware you will sacrifice the increased magnification and improved resolution. The optics in the Night Owl 42mm monocular product is also made using 100% real glass. The glass is coated for scratch resistance and improved clarity too. Does it have helpful features too? I touched upon how simple the controls on this were top operate. It has just two buttons simple buttons; one for the IR illuminator and one to turn the device on. There are also a few lens adjustment points to help magnify and focus this monocular. You won’t find a night vision device that is simpler to use and that is exactly how you want things to be when you need to quickly assess a potential target before taking a shot. This product is well-constructed too. 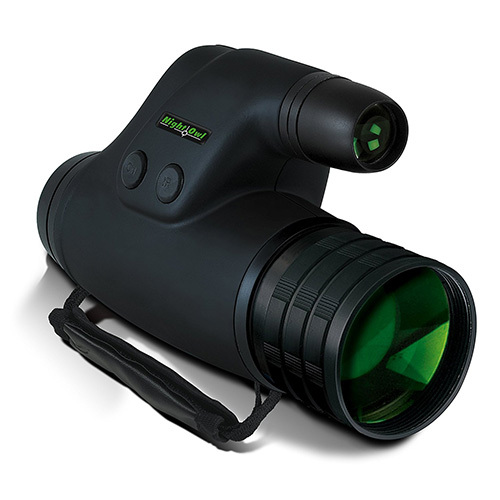 This Night Owl night vision monocular has a soft rubberized finish to it that will resist scratching and cracking. It lenses are also framed in good looking and sturdy polished aluminum. I think this model night vision monocular almost looks as good as it works. Even the handle strap is padded for better protection against wear and increased comfort while using this monocular. This device is super compact and lightweight too. It weighs less than a pound in total. You won’t get the arm strain that can be involved when using much heavier night vision products. What I liked best about these particular Night Vision Goggles? I am kind of a 50/50 guy when it comes to wanting increased magnification or wider field of view. If it was the increased magnification I am looking for then this would be the device I choose. Being able to see 3X as far as the human eye can be a big advantage at night especially if you are going after super cunning predators such as coyotes. Not only does this device have great 3X magnification but it also does it without losing a lot of clarity. So even game that is further away from you can still be easily identified with this robust night vision product. Simply put, this monocular night vision device does a little bit of everything well. It does sacrifice a little when it comes to the field of view but it more than makes up for that with its excellent IR illumination capabilities, its powerful magnification properties and the clarity of the image you see with it. These are all must have requirements when hunting for varmints at night. It is a monocular night vision device that is simple to adjust and very durable in its construction too. When I factor in such things as its reasonable price point and the quality of its optics it has, I have no problem whatsoever recommending thisexcellent night vision product for purchase.